A service tailor-made for those clients that do not have the time or inclination to produce survey reports themselves. The PeoplePulse Report Insights Division gives you the option to engage one of our independent 3rd party consultants to identify insights and prepare custom reports specifically matched to your requirements. Are resource poor – a great solution if you do not have the in-house experience or resources to manage the report generation process. Have time constraints – perfect for when you need to get your reports out quickly after your survey closes. Value an independent 3rd party – engaging an independent 3rd party to do your report analysis removes any inherent bias and helps ensure a balanced assessment of your results. Want to glean more insights – when you have a mountain of data and value another perspective, our specialist consultants can help you find the hidden gems of insight to keep you firmly focused on the issues that really matter. Uncovering the key insights from your survey that will help you drive important changes within your business. Presenting your survey data in the best light to clearly communicate it to your stakeholders. Creating professional presentations that ‘tell a story’ in a meaningful and interesting way for your audience. 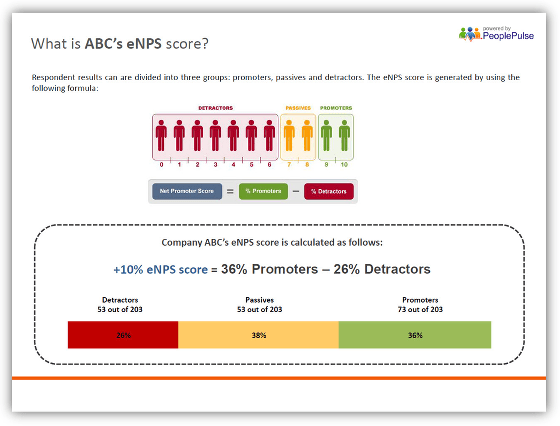 The Organisational Comparison Report is a special dashboard that is set up for you by the PeoplePulse Insights Team. 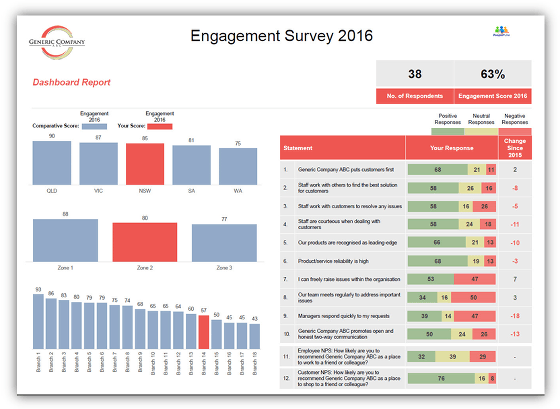 The aim of the Report is to provide each level within your organisation with a dashboard that shows year on year comparison between different related entities. 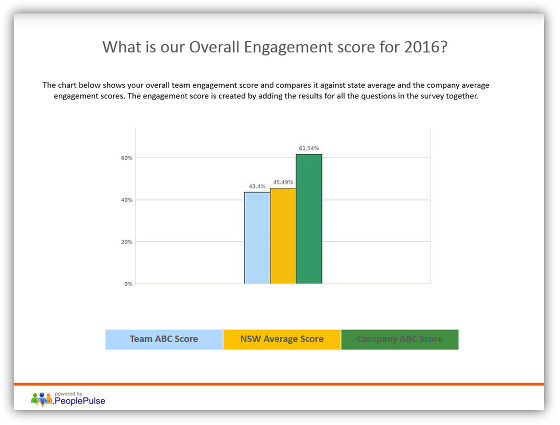 For example, Store or Branch Managers can see how their engagement score compares to the engagement score of other Stores or Branches within their Zone or State. On the same dashboard, Store or Branch Managers can also quickly see the areas they need to work on to improve their Store or Branch’s engagement. Provide a transparent snapshot to management of their relative performance.